The 11 Low has always been a summer classic and we were all happy that the recent “UNC” retro’d just in time. But, if you can fit into GS sizing, you’re about to get an exclusive that will make the full-sizers Jealous AF. The Gradeschool “Frost White” / “Heiress” 11 Low is set to hit retailers next month. Decked in all white, this 11 removes the infamous patent leather mudguard in favor of a synthetic croc skin – which looks a lot like elephant print. – with Pink accents on the tongue and heel. 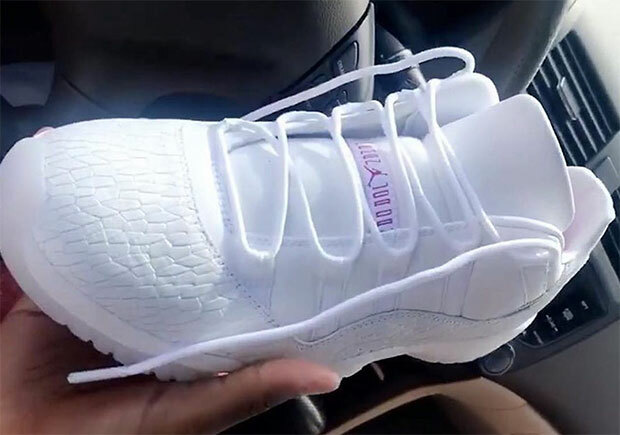 What do you think of this “Frost White” edition of the Air Jordan 11? As a size 13, I’m really annoyed. Stay tuned for more info and official images on these as it happens, and keep an eye on the upcoming sneaker releases via the Release Calendar.